At the end of my booking, what happens? When you complete your reservation, you get a pager and you can print the receipt of your trip. What is the fare shuttle? The shuttle fee is a fee that has a great savings but traveling with a group of passengers who must wait at the airport upon arrival. The maximum waiting time at the airport can reach up to 1 hour. The price that our system will provide, will be the end for the route reserved. Both babies (0-2 years) and children (3-11 years) have the vehicles because they occupy a seat shall be provided with a chair adapted to each circumstance. How much luggage I can take? 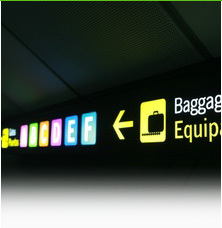 For all our vehicles are allowed one standard size suitcase and one carry-on baggage per person. If you come with extra baggage, such as: surfboards, golf clubs, wheelchairs ... it is important to us know in the comments of your booking to take adequate transportation the day of your arrival. What if my flight is delayed, what happens? There is no need to notify us, we have flight monitoring system to keep track of your flight arrival. I can travel in a wheelchair? How to find the contracted service at the airport? When you arrive at the airport, we will be waiting with a sign "Taxi Gran Canaria" which will be accompanied by your name. We have "baby seats" front-facing type, suitable for children weighing 9-18 kg (approx. 9 months to 4 years) and "booster seats", Suitable for children weighing 15-36 kg (approx. 4-11 years). We will do everything possible to ensure that the transport operator provides the child seat or booster that you requested. However there could be occasions when the seat requested might not be available. In such cases, you will have the right to a full refund for the amount that was incurred by reserving the seat. If there are no seats available, children over the age of three must use a seat belt. Children under the age of three can travel without a retention system but only in the rear passenger seats of the vehicle.